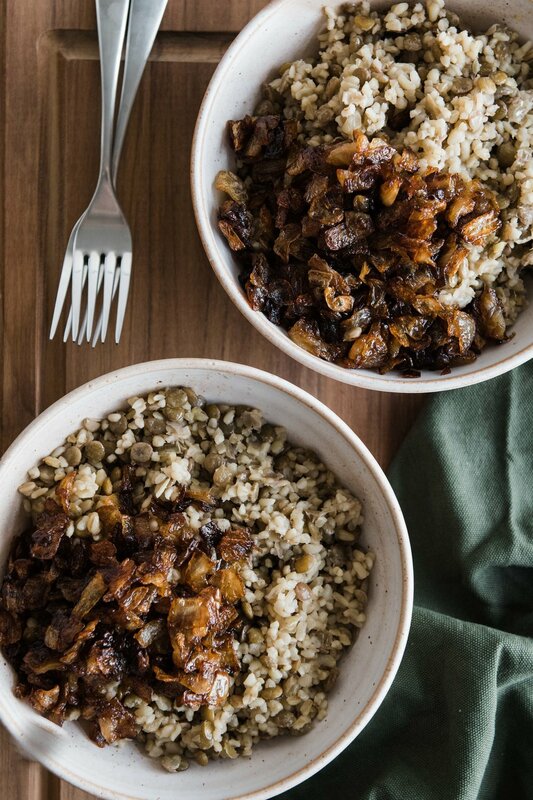 Today I’m sharing mujaddara, which is a bulgur wheat, lentil and browned onion pilaf. Mujaddara has been around for centuries. It uses humble ingredients and packs a ton of nutrients, making this truly an everyman dish. You’ll probably find this on the average Middle Easterner’s dinner table at least once a month. Mujaddara can be made using rice or bulgur wheat. I love the use of bulgur for 2 main reasons: a) it’s tastier and b) it’s more nutritious. In fact, my grandmother often replaces rice with bulgur in many dishes because of those exact 2 reasons. 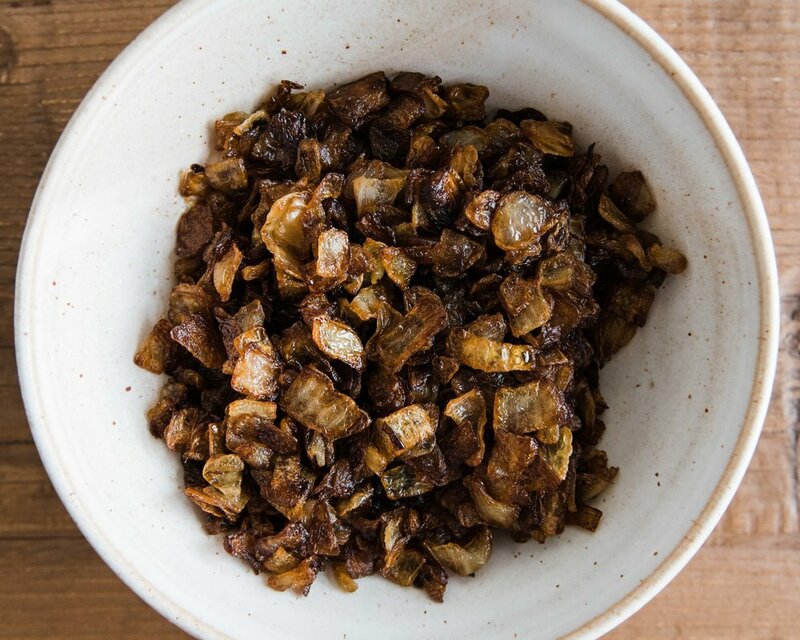 The onions are the real star of dish. They’re fried until they’re a delicious, rich, golden brown. The cooking oil is then repurposed to season the pilaf, and everything comes together beautifully. Mujaddara is typically served with yogurt, or, when summer produce is in season, you can serve alongside a salad of tomatoes, cucumbers, parsley and mint (called salata bistanieh). You can eat it warm, cold or at room temperature, making it the perfect meal-prep dish to eat throughout the week. Begin by browning the onions. Pour the olive oil into a large skillet over high heat and add the onions immediately to the cold oil. Cook, stirring frequently, until they are well-browned, being carfeful not to burn, about an hour. Once they are finished, drain using a fine mesh strainer fit over a medium bowl reserving the onion oil. Set onions aside. Meanwhile, boil about 6 cups of water in a large stockpot and add the lentils. Reduce to a simmer and let cook for about 15 minutes, or until they have softened but still have a bite. Drain, reserving the lentil liquid in a large bowl. Return the lentils to the stockpot and add the bulgur wheat, 2 tsp of salt, 1/4 c onion oil and 2 c of lentil liquid. Cover and set the pot on high and reduce to the lowest setting once boiling. After about 30 minutes, check for doneness. If the lentils are still hard and the bulgur hasn't cooked through, add a bit more water. Once everything is properly cooked, take off heat and add another 1/4 of onion oil to the mujaddara (or more if needed) and adjust seasoning. 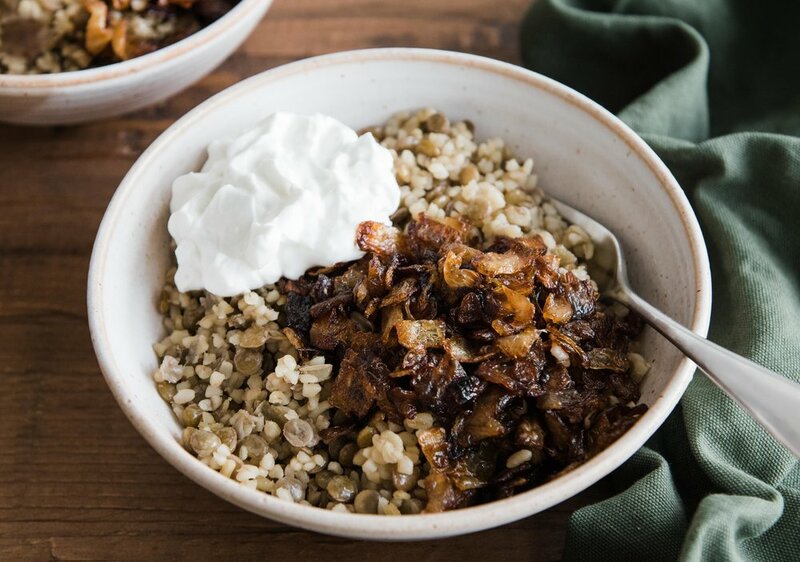 Place the onion and lentil pilaf onto a serving platter, top with browned onions, and serve immediately with yogurt. Can be refrigerated up to 5 days. Reheat before serving or eat at room temperature.